Safety Flag Bucket Brigade Sighted on Beacon Hill! 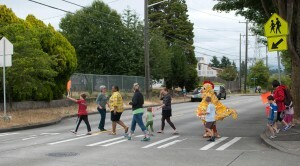 Drivers in southeast Seattle know South Graham Street as a great way to get to I-5. Going east from MLK Way in the Rainier Valley, the road slides up and over the middle of Beacon Hill in a comfortable arc, unimpeded by stop signs or traffic lights. In anticipation of the mountain view ahead, many commuters find it easy to step a little too hard on the gas. This past August, commuters were unexpectedly slowed by the sight of our Feet First chicken, Camina, and a flock of supporters from the neighborhood. The group was installing a safety flag bucket at the intersection of SE Graham and 28th Avenue SE, a crossing known to locals as difficult and sometimes harrowing. To help address the problem, the McCardle family worked with Feet First to install a safety flag bucket at the intersection. They hosted a flag decorating party at their home, inviting neighbors and school friends who use the crosswalk, including Dearborn Park Elementary Principal Angela Bogan. The children and adults spent a happy hour engrossed in the task of preparing 50 bright orange safety flags for the buckets. Once completed, they walked to the intersection, zip-tied the plastic buckets in place, and used the flags to help the chicken cross the road. “The orange flags help with visibility,” explains Feet First Safe Routes to School Director Jen Cole. “Walkers still need to be careful crossing, but it is remarkable how much easier it is to get a driver’s attention when you’re waving one of these bad boys,” she says, holding a flag freshly decorated with a picture of a fairy princess in a floor-length gown. In addition to the children’s drawings, each flag has information about the project and location, so that people know where to return any wayward flags. Key to sustaining a safety flag bucket set-up is finding a nearby neighbor like the McCardles to adopt the buckets and replace flags as they go missing. They store extra flags and replenish the buckets as needed, keeping five or six flags in play at any time. Fifty flags is enough to stock a typical intersection for about two years. 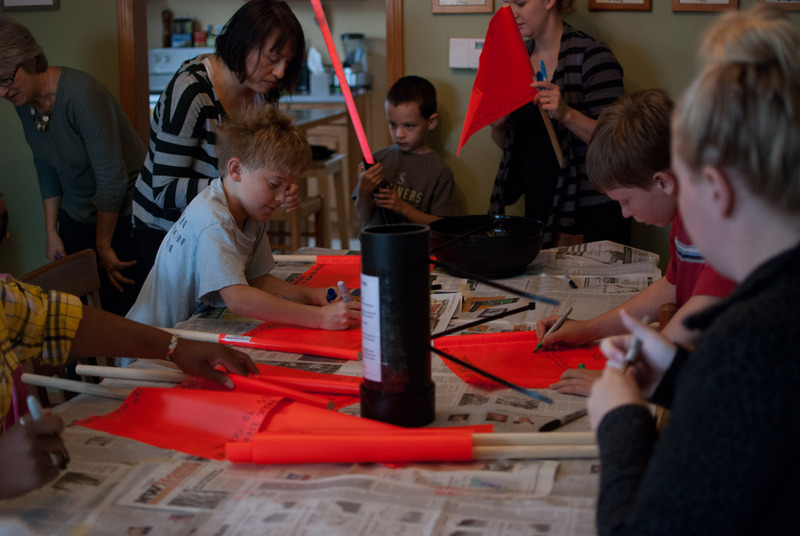 Instructions for making safety flag buckets are available online. 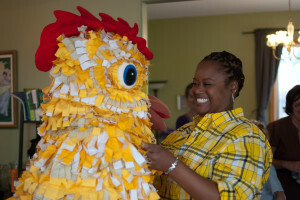 Only Dearborn Park Principal Angela Bogan knows the true identity of the Feet First Chicken! Feet First came to know this intersection through its Safe Routes to School grant project at Dearborn Park Elementary School. The project, funded by the Washington State Department of Transportation and managed by the Seattle DOT, provided for a Feet First walking audit to be conducted last spring, which identified this and other locations needing improvement. Feet First is planning a bucket installation in the Lake City neighborhood, at the intersection of 30th Avenue NE and NE 137th Street. 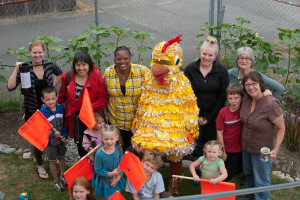 This will be done as part of our current Safe Routes to School program with Olympic Hills Elementary School. The intersection is along the route of a current Walking School Bus, and is also used heavily by high school students and other Metro riders who use the Metro stop at this corner. Contact us to learn how you can start a Bucket Brigade in your neighborhood or to find out more about Safe Routes to School for your children.